A rare mid 19thc highly decorative rosewood Anglo Indian console table, supported by four profusely carved legs terminating into monkey faces at the table top. This table has various influences from the British Isles, including an English rose, Scottish thistle and acanthus decoration. 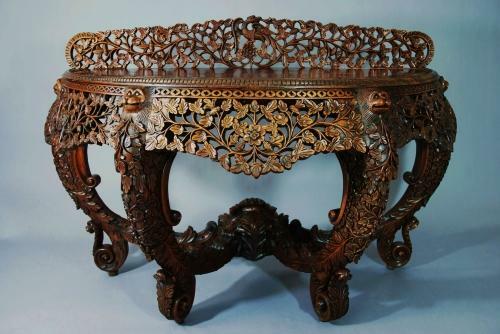 The top consists of a fine, figured piece of rosewood & a carved leaf & rose decoration around the edge. It has a decorative carved frieze with an eagle sitting on a rose at the rear of the table top.